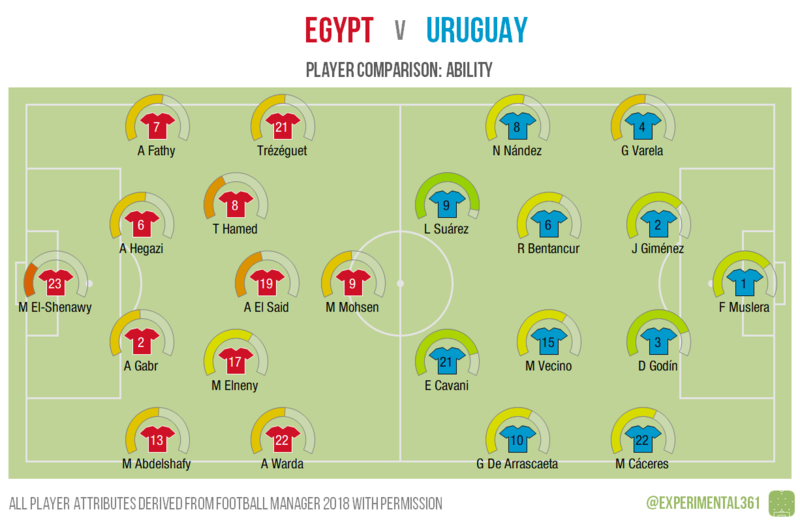 Following on from yesterday’s hurried post, here’s what the Football Manager 2018 data has to say about the line-ups for Egypt v Uruguay today. The explanation for this is in the link above, but in a nutshell I’ve treated the Football Manager database like a scouting tool and scored the two teams by combining their in-game attributes. 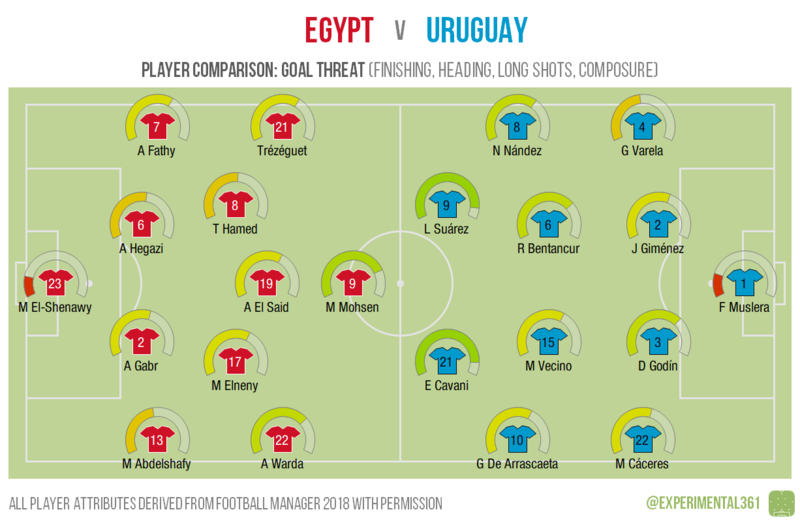 It looks as though Egypt’s goalkeeper could be their weak link, which isn’t ideal when faced with the formidable Uruguayan front two of Cavani and Suarez. Arsenal’s Mohamed Elneny looks to be the Africans’ classiest player, with his fellow central midfielders offering less than the wide attackers. Given that Uruguay’s defence looks stronger centrally than out wide, perhaps we should expect more of Egypt’s breakthroughs to come from the flanks? However he’s not going to have an easy time against Uruguay’s centre backs in this respect, but the aerial duels from set pieces at both ends should be fiercely contested. The Uruguayan number 10, De Arrascaeta, is only 5’8″, which explains his low rating here. Besides Mohsen up front, Salah’s understudy Warda on the right looks like a respectable option, but otherwise they aren’t awash with options. Uruguay look better equipped all round, with Godin a likely menace in the air even if their star attackers let them down. For Uruguay it looks as though Suarez is quite capable of carving out opportunities by himself, but the central midfielders and left winger behind him are all pretty creative (Nandez on the right looks to be more about mobility as we saw above). For Egypt the right flank looks most promising if Abdelshafy and Warda can combine, with El Said likely to be the main instigator otherwise.